I'm not a big fan of traditional Dutch cuisine, but this pie is definitely a keeper! Ask any Dutch person to name the most famous dish from Limburg (the province, located in the southeastern part of the country) and they will for sure answer "vlaai". Vlaai, also known as Limburgse Vlaai, is a pie consisting of a pastry and filling. 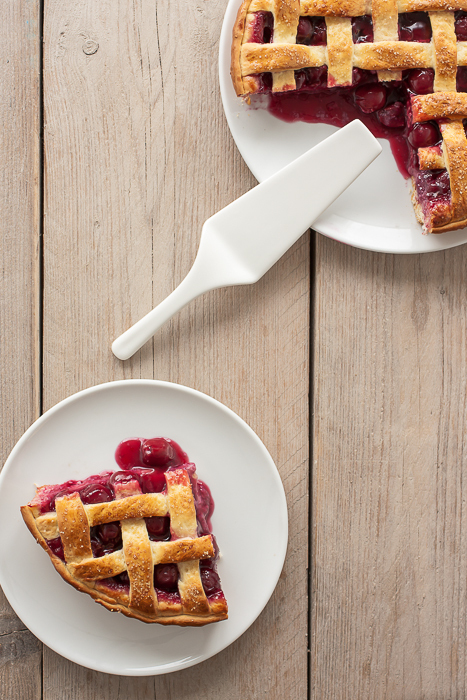 It looks a lot like a usual lattice crust pie or Linze Torte, but the main difference is that a pie or torte are made from a shortcrust dough, whereas vlaai is made from a yeast dough. This gives the pastry a totally different consistency and taste. For the filling you can use different varieties of fruit such as cherries, apricots, plums, strawberries, etc. 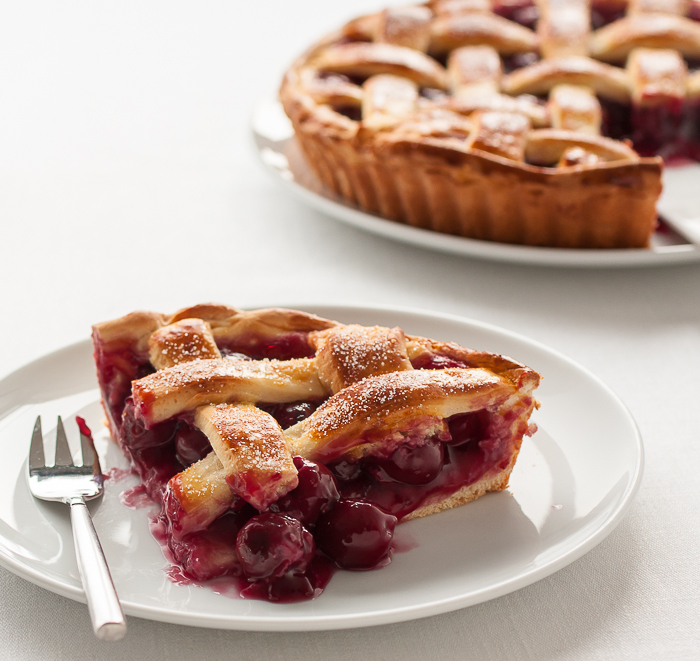 I baked mine with cherries and it was delicious! 1. Dissolve yeast and sugar in milk. Add a half of flour to the mixture and let stand 10-15 minutes. 2. Put the rest of the flour, salt, egg yolk and butter in an electric mixer fitted with a dough hook and pour in the milk mixture. Beat at a low speed to combine for about 5 minutes. Then switch to a medium speed and beat for about 10 minutes. The dough should be smooth, elastic and not sticky. 3. Remove the dough hook, leaving the dough in a bowl. Cover with a tea towel or cling film and live to rise at a warm place for about 1-1.5 hour until the dough will double in volume. 4. Meanwhile prepare the filling. Drain the cherries and put the syrup in a saucepan. Place it over a medium heat. 5. In a small bowl combine 4 tablespoon of the syrup with cornstarch, stir with a spoon until dissolved. Pour the cornstarch mixture and sugar into the hot cherry syrup, mix well and cook over a low heat until thickened, stirring frequently. Remove from the heat, add kirsch and cherries. Cool completely. 6. Preheat the oven to 200C. Grease your cake tin with some butter. Take about 2/3 of the dough and roll it out into a flat disk about 0.5 cm thick. Cover your cake tin with a dough disk, trim off excess pastry with a knife, or by rolling a pin over the tin. Sprinkle the bottom with almond flour, it will absorb the liquid and will help to keep the bottom dry. 7. Spoon cooled cherry mixture into the pastry. Roll out the remaining dough into a 24 cm-round. Using a sharp knife, cut the round into strips about 1.5-2 cm wide. 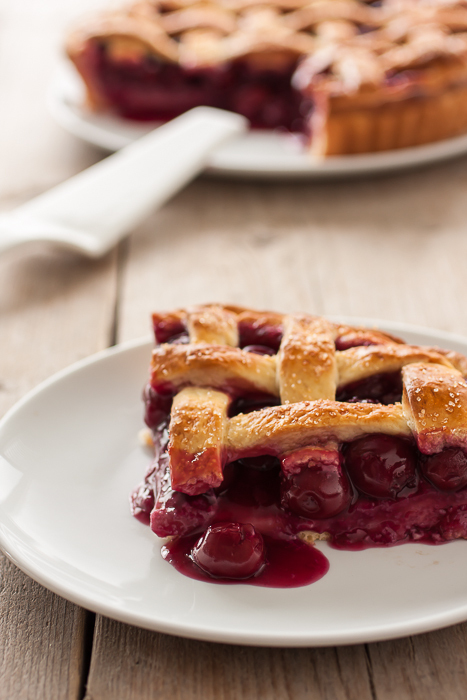 Arrange the strips over the filling to create a criss-cross lattice pattern. Trim off the excess pastry, make sure that they stick well to the edges. 8. Brush the lattice with eggwash (a yolk lightly beaten with 1 tbsp milk) and sprinkle with brown sugar. Put to the oven and bake for about 25-30 minutes. 9. Remove from an oven, place on a wire rack and leave to cool for 20 minutes, then remove the pie from the tin and let it cool completely.